For the Cathedral’s historic beginnings: Sacred Spaces and Anglican-Hawaiian History. We begin with love, the ethic our Lord Jesus Christ lived every moment of his earthly life. We strive to respect the dignity of all and, when we (inevitably) fall short, we try to atone and improve. In worship, we celebrate the beauty of holiness and give glory to God. Our Christian faith is ancient, yet it is regularly renewed in today’s world via service, worship, study, and selfless acts. We are willing to accept the challenge and responsibility of cultivating our personal formation as practicing Christians. We engage the contemporary world without fear. We believe the teachings of Christ are as important and relevant to it as to us. We seek to address the causes of human suffering in order to lessen it. We seek to live the truth and the aloha of our location. We are mindful of the beauty and aloha of this place. We are grateful for the royal commissions and tradition of support that makes this magnificent Cathedral possible. Still, we are mindful that each of us proclaims true beauty in how we live, and in how we love each other and all who enter our doors. 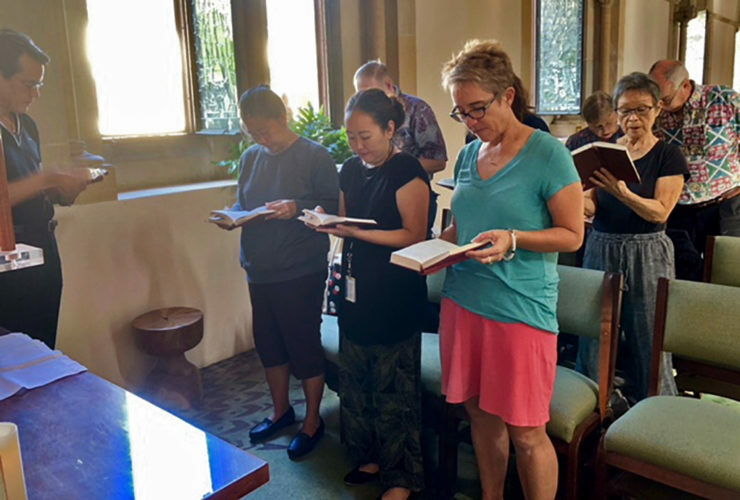 Oʻahu means “The Gathering Place.” Let us be that, let us offer some respite to the poor in spirit, the sick and needy, and souls in transition. This heritage belongs to all, regardless of belief. Thus, whatever your faith tradition, you are welcome.